When Nintendo announced that they would sell two different bundles for the Wii U, they labelled one of them the Deluxe Edition. Deluxe meant that the console was black, it came with a stand and it included a copy of Nintendo Land. The Deluxe Edition also featured a Deluxe Digital Promotion, something Nintendo claimed would reward players for buying digital goods. They did not, however, indicate exactly how the Deluxe Digital Promotion would work… That changed today. For example, a game priced at $59.99, such as New Super Mario Bros. U, would earn 599 points. For every 500 points they earn, participants will receive a code worth $5 in credit to be used in the Nintendo eShop for either Wii U or Nintendo 3DS. The promotion will run from the system’s launch on November 18th on December 31st, 2014. That’s plenty of time to earn virtual money for digital goods. Look at it this way: when Nintendo offers DLC, buying a game digitally will pay for half of the first content pack. REDMOND, Wash.–(BUSINESS WIRE)– As Nintendo prepares to launch the revolutionary Wii U home console on Nov. 18, consumers in the United States can look forward to a special promotion that will give select Wii U owners even more bang for their entertainment buck. Nintendo today revealed details about the Deluxe Digital Promotion, which lets consumers who buy the Wii U Deluxe Set earn points when they purchase downloadable games and redeem those points for even more fun digital content in the online Nintendo eShop. The promotion gives Wii U Deluxe Set owners a big incentive to connect their systems to the Internet and discover a constantly expanding array of downloadable games, entertainment offerings and cool ways to connect with family and friends. All Wii U Deluxe Set owners who purchase digital content for Wii U, including downloadable games in the Nintendo eShop for Wii U and download codes sold at select retail stores, will earn points with a value equivalent to approximately 10 percent of the Nintendo eShop list price of each purchase. For example, a game priced at $59.99, such as New Super Mario Bros. U, would earn 599 points. For every 500 points they earn, participants will receive a code worth $5 in credit to be used in the Nintendo eShop for either Wii U or Nintendo 3DS. 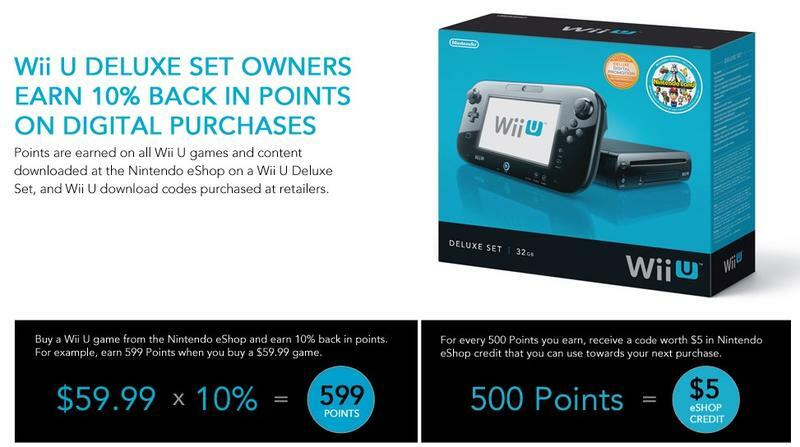 Points will be earned on all digital purchases made on a Wii U Deluxe Set from Nov. 18, 2012, until Dec. 31, 2014. When the Deluxe Digital Promotion website launches in December, participants can see the points they’ve earned and receive codes for Nintendo eShop credit by signing in with their Nintendo Network ID and password. Codes must be received at the website by March 31, 2015. Received codes must be exchanged for Nintendo eShop credit on Wii U or Nintendo 3DS by June 30, 2015. Nintendo eShop credit on Wii U and Nintendo 3DS does not expire. The Wii U Deluxe Set offers extraordinary value right out of the box. Launching Nov. 18 at a suggested retail price of $349.99, it includes a black Wii U console, black touch-screen Wii U GamePad controller, sensor bar, AC power adapters and stands for both the console and the controller, a charging cradle for the GamePad, an HDMI cable and a copy of the Nintendo Land game, which features 12 playable attractions based on Nintendo’s most imaginative and beloved game franchises. Consumers who purchase the Wii U Deluxe Set can use the Deluxe Digital Promotion with a Nintendo Network Account. Qualifying Nintendo eShop purchases in the Deluxe Digital Promotion include games and content published by Nintendo as well as games from third-party publishers. Digital content purchases from the Wii Shop Channel are not eligible for Deluxe Digital Promotion points. Purchases from the Nintendo eShop via Nintendo 3DS hand-held and Wii U Basic Set systems are also ineligible. Remember that Wii U features parental controls that let adults manage the content their children can access. For more information about this and other features, visithttp://www.nintendo.com/wiiu. For more information about the Deluxe Digital Promotion, visit http://ddp.nintendo.com. About Nintendo: The worldwide pioneer in the creation of interactive entertainment, Nintendo Co., Ltd., of Kyoto, Japan, manufactures and markets hardware and software for its Wii U™and Wii™ home consoles, and Nintendo 3DS™ and Nintendo DS™ families of portable systems. Since 1983, when it launched the Nintendo Entertainment System™, Nintendo has sold more than 4 billion video games and more than 637 million hardware units globally, including the current-generation Wii U, Nintendo 3DS and Nintendo 3DS XL, as well as the Game Boy™, Game Boy Advance, Nintendo DS, Nintendo DSi™ and Nintendo DSi XL™, Super NES™, Nintendo 64™, Nintendo GameCube™ and Wii systems. It has also created industry icons that have become well-known, household names such as Mario™, Donkey Kong™, Metroid™, Zelda™ and Pokémon™. A wholly owned subsidiary, Nintendo of America Inc., based in Redmond, Wash., serves as headquarters for Nintendo’s operations in the Western Hemisphere. For more information about Nintendo, please visit the company’s website athttp://www.nintendo.com.